Where are the Energy Price Impacts? Update : 10 December, 2014. DECC has now released the energy price impacts. On the eve of the deadline expiry, DECC yesterday responded to REF’s Freedom of Information request for the ‘estimated impacts of energy and climate policies on energy prices’; data inexplicably omitted from their study titled Estimated Impacts of Energy and Climate Policies on Energy Prices and Bills (2014). Their response can be read here. The price impacts (p/kWh) of Government’s green policies have been published in all previous issues of this key document, and indeed are explicitly referred to in its title. Price impacts are extremely important because they permit analysts and members of the public to assess the raw impact of policies, before the claimed offsetting impacts of energy efficiency, for example, are taken into account. This allows the reader to form a view of the plausibility of the offsetting effects and also to estimate impacts on particular users rather than on the ‘average’ users upon which DECC’s study focuses. This latter point is very important for business consumers, because businesses vary so much, with the ‘average’ business being almost meaningless. On the 6th of November the Department of Energy and Climate Change (DECC) published the third and much delayed edition of its Estimated Impacts of Energy and Climate Change Policies on Energy Prices and Bills. REF has previously criticised the methodology used in the previous two issues of Estimated Impacts (2011 and 2013), particularly the tendency to focus on modelled average bills not price effects and so conceal important variations in effects on different types of domestic households. DECC also made use of unreasonably optimistic assumptions with regard to the effects of energy efficiency measures. For further details see our study Shortfall, Rebound, Backfire (2012), and subsequent correspondence with DECC and the UK Statistics Authority. The latest, 2014, release of Estimated Impacts continues to suffer from many of the faults identified by REF in previous editions, and is rendered still more unsatisfactory because the tables showing the electricity and gas price impacts (£/MWh), rather than modelled average bill effects, have been deliberately withheld, even though they appeared in the three previous editions. On the 7th of November the wind farm developer and green electricity supplier Ecotricity placed a double page spread advertisement in the Guardian newspaper. This advertisement claimed that wind power played a significant part in securing supplies on the 19th of October, when four nuclear power stations were already offline and the system came under further pressure in the evening because of a fire at Didcot B power station, a Combined Cycle Gas Turbine (CCGT) power station. These claims are repeated on the Ecotricity web site: “Nothing Happened”. REF is saddened to report the death of Robert Freer, one of our technical advisors, and a keen supporter of our objectives. Robert Freer was a civil engineer who worked mainly on energy and maritime projects and especially at the interface between research and practice. He was involved in the design and construction of nuclear, hydro-electric, diesel, and gas turbine power stations in this country and overseas (including Dounreay, Winfrith, Kariba and Aswan) and on the development of a prototype wind energy generator and a wave energy device. He was awarded the George Stephenson Medal by the Institution of Civil Engineers in 2002, and organised and led two DTI sponsored OSTEMS visits to a number of European countries and to Japan on dam safety and on energy from waste. Robert also served on a number of committees of the Institution of Civil Engineers on the ICE Council. Robert’s funeral will take place on the 29th of September at 11am at St George’s Church, Hanover Square. The Sunday Telegraph recently published an article giving further details of the constraint payments made to wind power, mostly, though not now entirely, in Scotland. The principal point was that the prices charged were still well in excess of lost income, and were arguably an abuse of market power. The Department of Energy and Climate (DECC) has responded to the piece and attempts to defend both the wind power industry and its own record in protecting the consumer from over-charging. DECC’s response contains a number of irrelevant or confused statements suggesting that the Department either does not understand the constraints market or is seeking to mislead the public. This is misleading. Additional payments to stop generating are in fact a new phenomenon, and are the outcome of lost subsidy. Indeed, since wind power generators actually ask for more than the subsidy lost when constrained off, their income is greater per MWh when not producing electricity than when they are generating and selling their electricity as normal. This increases consumer costs. By contrast, when conventional generators are asked to stop generating, these generators pay back into the system because they have saved the value of the fuel. This means that consumer costs are reduced. Furthermore, while DECC is correct in saying that National Grid pays conventional generators to change their planned output, this is irrelevant to the wind case, since National Grid is asking the conventional generators to start generating; a very different market service which can, of course, incur an increased cost. What DECC does not mention is that each MWh of wind electricity constrained off the system must be replaced by a MWh of conventional electricity the other side of the grid constraint. Consequently, those energy companies owning both wind farms in Scotland and conventional generation elsewhere may be benefitting twice over from the Government’s policy of encouraging the building of wind farms in areas of the country that are frequently unable to export their electricity. DECC also writes that "The payments are made on a competitive bid basis to ensure that these costs are as low as possible.” This is misleading. In fact the constraint market is extremely illiquid since grid constraint problems are geographically specific, and often National Grid has little or no choice of which wind farms to constrain. This ‘over-a-barrel’ situation may be part of the reason why wind constraint prices are so high. Firstly, is important to note that DECC admits that prior to 2012 the prices charged were indeed ‘unfair’. It would be interesting to know if they intend to recover those unfair charges from the wind farms concerned. Secondly, we observe that the prices charged by wind farms to reduce output range from £25 to £78 per MWh more than the lost subsidy of approximately £50 per MWh. It is far from clear that the scale and the range in premiums could be justified by the transaction costs of constraining off a wind farm. We conclude from DECC’s response that the department is unwilling or unable to protect the consumer against market gouging. This gives deep cause for concern since the scale of the constraint problem is almost certain to grow, and if this excessive pricing is not nipped in the bud, high prices will become an acceptable norm with damaging consequences for the consumer. REF's director, John Constable, has just published an article "Thermo-Economics: Energy, Entropy and Wealth" in the journal of the Economics Research Council. This piece attempts to explain the relationship between thermodynamics and the theory of wealth in economics. From this perspective Dr Constable then argues that government attempts to drive an energy transition ahead of the learning curve and against the cost gradient and dangerous and likely to be reduce well-being as well as creating political discontent. On the 3rd of April the Guardian published a short article on constraint payments to wind power in Scotland ("Gas company special payments dwarf constraint payments to wind farms"). This story was based in part on a story in The Times earlier in the week ("Wind farms are paid £8.7m in one month to stop turbines"), and partly on an interview with REF. Your article (“Gas company special payments dwarf constraint payments to windfarms” 04.04.14) mistakenly downplays the significance of wind farms in Scotland demanding compensation well in excess of the subsidies lost when National Grid needs to stop them from generating. This is already very expensive and set to become more so. The article also surprisingly implies that because conventional generation is paid to be constrained “on" to the system it is somehow acceptable for wind farms to overcharge per MWh when they are constrained “off". However, such a view not only glosses over the economic and technical differences between constraining generation “on” and constraining it “off", but also fails to recognise the causal relation between these two actions, namely that constraining off wind farms on one side of a grid bottleneck, means that conventional generators on the other side, often gas, must be constrained on to maintain continuity of supply. Thus, a significant proportion of the constrained on payments received by conventional generators must also be attributed to the proliferation of wind farms in Scotland, where the Connect & Manage policy has permitted and even encouraged wind development to exceed grid capacity. It is possible, perhaps likely, that some energy companies who own both wind farms and conventional generation are making unreasonable profits on both sides of the equation, but a lack of transparency in the reporting of electricity market data makes it impossible for those outside the industry to investigate this matter. The consumer is clearly vulnerable to unchecked exploitation at present, and strong intervention by government and the regulator, Ofgem, is long overdue. It is now three years since the Renewable Energy Foundation revealed the growing problem of excessive prices charged by wind generators in Scotland to cease generation. However, and in spite of an intervention in February 2014 by the Minister of State for Energy, Michael Fallon, MP, there is no sign that the wind industry is willing to deal with this profiteering through self-regulation. 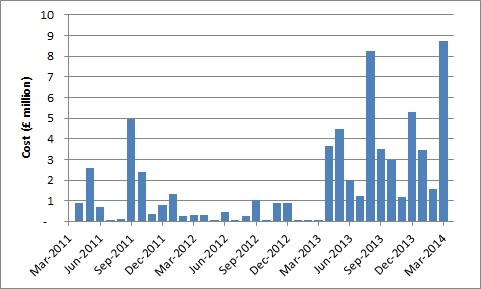 March 2014 has seen both the largest monthly volume of wind energy (107 GWh) constrained off the GB electricity system, and the largest monthly amount paid for wind farms not to generate (£8.7 million), as can be seen in the following chart, which also shows the steadily increasing trend over time. Wind farm constraints are essentially caused by difficulties in exporting excess wind electricity generated in Scotland. In March 2014 approximately 12% of the potential wind power output of large Scottish grid connected wind farms had to be constrained off the system, thus incurring costs to the consumer in the form of constraint payments. Griffin wind farm showed the greatest reduction in output with more than 60% of its potential output in the month constrained off. The average price charged by the wind farms to reduce output was £80/MWh. This is almost double the lost income (a price of about £45/MWh to compensate for lost subsidy would be justifiable in the current market arrangements). It is these excessive prices that Mr Fallon sought to address with his letter. But the industry does not appear to have taken any notice whatsoever, and while we understand the reluctance of government to intervene in the setting of prices in any part of the market, it is clear that wind power constraints are a special case, arising from the market distorting effects of state income support subsidies to renewables, and that consequently the time for vigorous government intervention has now come. The scale of the growing threat to the consumer interest can be appreciated from the following charts, which record quarterly total wind power constraint costs and volumes. The first quarter of 2014 has seen £13.7 million paid to wind farms to reduce output, which is a record in itself, but also confirms concerns that there is a trend towards consistently high constraint payments over the last year. Conventional generators (coal and gas for example) are not paid extra to stop generating. Indeed, because of avoided fuel consumption they pay back to the system when constrained off. Wind power, on the other hand, loses subsidy when it is told to stop generating, and therefore asks for compensation, and in practice wind farms ask for compensation well in excess of the lost subsidy. This excess is clearly an abuse of market power and should be investigated by the regulator, Ofgem. In December 2012 REF published Professor Gordon Hughes’ paper The Performance of Wind Farms in the United Kingdom and Denmark. This seminal paper used advanced but standard statistical techniques to estimate the rates of decline in performance over time. Professor Hughes found that the economic lifetime of wind farms in the UK was very much shorter than currently estimated, at between ten and fifteen years, with those in Denmark faring better but still declining significantly. The study has attracted a great deal of attention, and its fundamental finding is not now contested. Decline in performance is real and should be taken into account by policy makers and investors since it has significant implications both for the subsidy cost of the current renewable energy targets, and for the levelised cost of wind electricity and thus the rate of return to capital. The study has been the subject of considerable criticism, particularly with regard to the methods employed, and Professor Hughes has responded and defended his approach (for example here in response to Professor MacKay, Chief Scientific Advisor to the Department of Energy and Climate Change and here in response to remarks by a blogger, Mr Chris Goodall. Other researchers have begun to follow the lead given by Professor Hughes, and Dr Iain Staffell and Professor Richard Green of the Imperial College Business School have recently published a paper in the journal Renewable Energy. This study uses different methods, and though it confirms the finding that performance declines significantly over time, it reports a lower rate, of about 1.6% per year, with “average load factors declining from 28.5% when new to 21% at age 19.” Staffell & Green note that this has the effect of increasing the levelised cost of electricity from wind by 9%. REF believes that the debate has moved on from whether wind farm performance declines with age, as that is clearly confirmed, to the technical issues involved in measuring the rate and profile of the decline. The Staffell and Green paper proposes an approach that compares actual output with ideal output based on interpolated wind data. The potential difficulties of this specification are outlined in the Appendix to Professor Hughes’s paper and are not resolved in the new paper. Hence, we are not convinced that the Staffell and Green’s approach is superior to the statistical methods employed by Professor Hughes. In one respect, we believe that the Staffell and Green analysis is clearly inferior to the Hughes specification. Namely, their model does not allow for the effect of technical progress in the wind industry through improvements in operating and maintenance practices, which can be treated separately from changes in turbine design. This was built into the Hughes specification and few would dispute that such technical progress has occurred in the past. Work carried out by Professor Hughes – and made available to Dr Staffell and Professor Green – shows that the rate of such technical progress has fallen markedly since 2008. The reason this matters is that Staffell & Green and Hughes have both confirmed that specifications that allow for such technical progress yield higher estimates of the rate of decline in performance with age than those, including the new paper, which do not. In statistics this is known as omitted variable bias. In summary, REF’s view is that while the new paper makes a useful contribution to public discussion of the performance of wind farms, Staffell and Green’s methods are not statistically superior to those used in the Hughes study. Indeed, Staffell and Green’s specification contains an assumption that results in a significant downward bias in the estimate of the rate at which performance declines with age. We will provide fuller details of these points in due course.